SCR services 'Sweeney Todd' well with a soaring production that gives voice to the master's masterwork. In the second half of the 20th Century, Stephen Sondheim wrote the music and lyrics for 14 full productions and lyrics for another half-dozen. The range of subjects and styles he explored gave the American musical new backbone and set a high bar for those who followed, dividing the genre into before and after Sondheim as undeniably as the Rockies divide the continent. 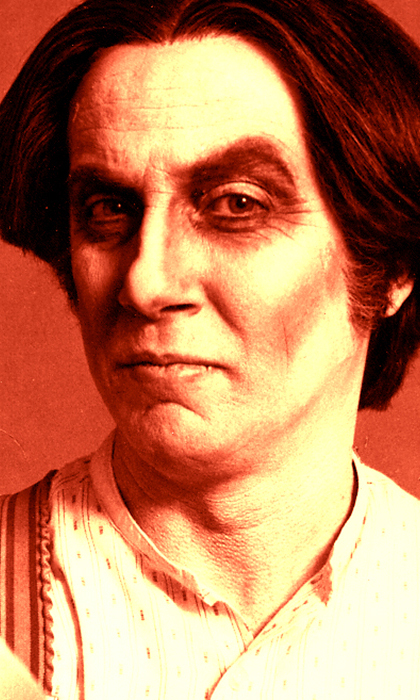 Among all those musical peaks, many believe he was at the height of his powers with Sweeney Todd, The Demon Barber of Fleet Street, which opened on Broadway 40 years ago last Friday. As is his custom, Sondheim illuminates Sweeney's themes with story-appropriate theatrical and musical styles of the period, in this instance operetta and music hall comedy. One notable production marking this anniversary year is Kent Nicholson's staging at South Coast Repertory, which ran from January 19 to February 16. Nicholson and Musical Director-Conductor David O chose the alternate, scaled-down version for 11 actors and nine musicians, and packed it with Broadway-caliber voices and players to make the "Musical Thriller" a thrilling musical. Set in Victorian England as the Industrial Revolution was helping cement the lower classes at the lowest socioeconomic stratum, Sweeney Todd's themes resonate today in, among other issues, outrage over the continuing concentration of wealth and an inequitable justice system that helps sustain it. Barber Benjamin Barker returns to London after 15 years in a distant penal colony. Now calling himself Sweeney Todd he wants revenge on the local judge and constable who falsely arrested, prosecuted and sentenced him. 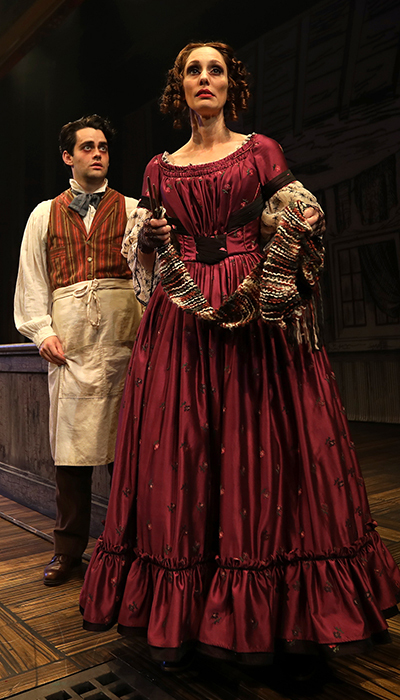 He locates his old second-story shop and finds in its landlady, Mrs. Lovett, the widowed owner of the failing first-floor pie shop, a willing accomplice. 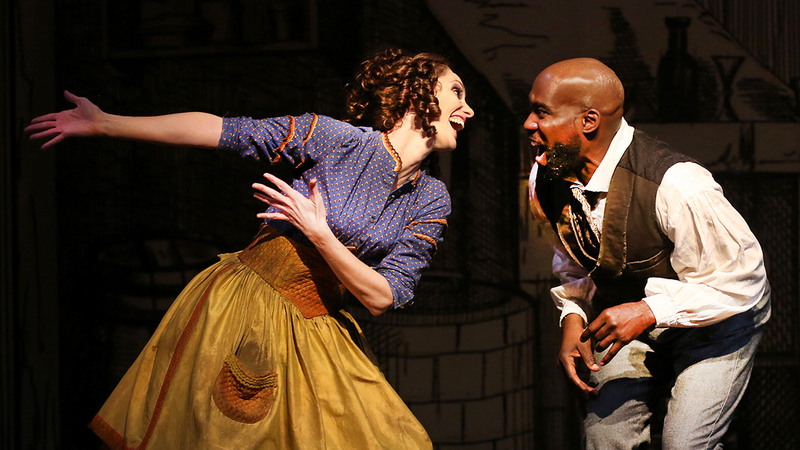 Todd and Lovett are the heart of Sweeney Todd and Nicholson's staging benefits from two actor-singers whose names, I feel, now belong among those etched in the show's hall of historic performances. David St. Louis, with a baritone born to summon up righteousness, gave the tormented Todd a voice of Biblical reckoning. Though clearly coincidental, as the one African-American in the cast, St. Louis' Sweeney also inserted a visual reminder of those ongoing imbalances in both our law enforcement and justice system. Jamey Hood gave a fully developed Lovett, bringing precision comic timing that never overstepped its bounds. Her pie-eyed goofiness can be seen as masking a rekindled furnace of unrequited feelings for the barber. Hood, whose deft comedic gifts caught our attention playing – of all things – a Crayola in 2008's Theater for Young Audiences premiere of Doug Cooney's Imagine, had previously played the Baker's Wife in three productions of Sondheim's Into the Woods, Amy in a production of Company, and Charlotte in a one-night concert version of A Little Night's Music that raised money for a Broadway charity. She had loved the PBS Sweeney in her youth, but when she started out in theater she couldn't imagined herself in any of the female parts. She filed the show with those she was just "glad were out there." Then a decade ago, a PCPA production opened her eyes to someday playing Mrs. Lovett or the Beggar Woman. "But then," she said in a phone interview days after the show closed, "Mrs. Lovett showed up a little sooner for me than I had anticipated." David O, with whom she had frequently worked before, invited her to submit an audition tape and within a week Casting Director Joanne DeNaut let her know that Nicholson was "very interested in you." Once cast, she really began to explore the character of Nellie Lovett. "In preparing for the role I felt very driven by her love and desire for Benjamin," she said. "My highly intelligent sister, who saw the show four times, said that the silver razors she now returns to Barker wouldn't have stayed polished in a box like that: They would have tarnished. So, there's a part of Mrs. Lovett that has been getting that box out regularly and shining up that silver: Never selling it. Yeah, she's been carrying a torch for sure." "Looking at it from just her point of view," she continued, "I was surprised at how many threads she had going. She had a lot of irons in the fire and she kept turning them all a little bit in every moment. She had the mental capacity to keep track of all of her deceptions and stay focused on her desires at all times. She needed him to wait [on taking revenge] so that they could have more time together. All of these things were happening simultaneously. I had no idea how much she drove the story and manipulated so many other lives – for better and for worse. She's a wildly complex character." That complexity has to encompass opposing forces, such as "her actual love for Toby," Hood noted. "But as soon Toby makes the wrong discovery, there's no saving him. And it's very sad for her, but also necessary. She's a survivor and she's going to get what she wants at any cost. That was a fun discovery to make." 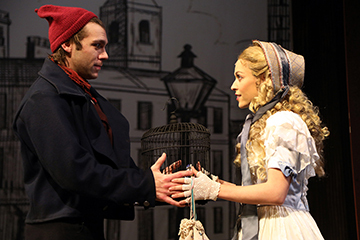 Hood also came to understand what was probably Lovett's opinion of Sweeney's wife Lucy, whose beauty had driven the covetous judge to, as the song goes, "remove the barber from his plate." "She definitely didn't think Lucy was good enough for Benjamin," Hood believes. "But I wondered if she hadn't some charity for Lucy all those years. I had the idea that she was somewhat kind to Lucy and would give her pies. But that ended as soon Benjamin showed up again." A production this good excels because there isn't a false note among the voices, and credit to the casting – and orchestra contracting – on assembling such an eminently recordable company. Juliana Hansen's Johanna was breathtakingly beautiful, with an operatic voice that soared like the birds with whom she commiserated. Devin Archer gave her suitor Anthony an energized tenor for the ballad that bears her name, one of the most beautiful in the entire Sondheim canon. Together they shared a scrubbed innocence that somehow helped them avoid the tragedy that befell every other character. As Tobias, Conlan Ledwith showed his range at the opposite ends of the composer's craft: pouring out Pirelli's dense hair-tonic spiel and then delivering the heart-breaking "Not While I'm Around," another classic ballad that comes just before his damning discovery. The others include Robert Mammana as Judge Turpin, Nicholas Mongiardo-Cooper as Beadle Bamford, Roland Rusinek as Pirelli, and Erica Hanrahan-Ball as the Beggar Woman. And, in various roles, Brent Schindele and Katy Tang. "I work on a lot of musicals, primarily new musicals," Nicholson told me in 2018 for a magazine article. "So I work directly with a lot of composers and writers and in my opinion nobody combines all of the elements that go into creating the perfect theatrical experience the way Sondheim does. So it's always great to dig into his work and see how he does it – see how the mechanics of it work. It helps me understand what I do with contemporary writers. And though this is only my second Sondheim production, it's my favorite of all his musicals. So, I'm feeling very fortunate." For her part, Hood felt just as fortunate to be among that company. "For me, the words are the thing," she said. "There is no quality to be played. I wouldn't make a guess at who she is until I understood the words and the action underneath. Then, when we all finally hit the stage, I was like, 'Everybody is so amazing! It just felt like, 'Alright, we're playing ball here: This is a big professional ballgame on stage." A 1981 article chronicling obsessions with Stephen Sondheim that meet over lunch with actor George Hearn on Nob Hill in San Francisco.